The NewTek Connect Pro product line is available in both hardware and software. NewTek helped us get to compressed IP with NDI. Now they are providing a bridge to uncompressed IP with NC1 Studio I/O IP. With all the committee and standardization work churning the broadcast production firmament, the transition to uncompressed IP-based production is still a moving target. But at IBC 2015, NewTek gave us our first step to switching from a SDI (Serial Digital Interface) infrastructure to packetized IP using compressed signals by introducing their Network Device Interface (NDI). Their approach employed a bi-directional SDI/IP protocol that they gave away in a royalty-free SDK (Software Development Kit). By transporting a compressed signal, NDI was an easy fit for the Gigabit Ethernet wiring that already existed in many facilities. Since then there have been 2400 independent downloads of the NDI SDK resulting in over 400 NDI-equipped professional products and up to 5 million consumer and pro-sumer pieces of equipment that are NDI-enabled. 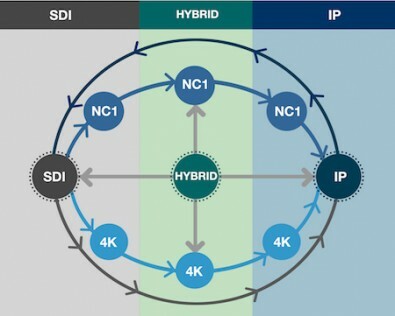 Now, however, the SMPTE ST 2110 specification for uncompressed IP transport is about to be released sometime this summer and production facilities are going to need a gateway to get from their compressed IP signals to uncompressed studio IP infrastructure. And again, NewTek has a solution. They call it their NewTek Connect Pro product line. We saw it at the NAB Show 2017, but it was given an underplayed “soft launch” since as the parameters for SMPTE ST 2110 were still being formulated, NewTek’s Connect Pro design was tracking its development in parallel. Now, however, in an exclusive interview with The Broadcast Bridge, Will Waters, director, product marketing and sales enablement at NewTek and Scott Carroll, NewTek’s director of public relations, tell us that they are ready to help content creators get from the one Gigabit bandwidth requirements of compressed IP to the over 10 Gigabit bandwidth of an uncompressed IP signal stream. From NewTek’s perspective, production systems are all about software and IP is the way software talks to software. A key example of this will be remote production trucks which have been built out based on a one Gig infrastructure. They will still need to interface with the 10 Gig IP systems back at the studio. NewTek's NC1 Studio I/O IP can get you from compressed to uncompressed IP. That’s where the NewTek Connect Pro gateway technology comes in, especially their NewTek NC1 Studio I/O IP Module. The NewTek NC1 Studio I/O IP is a turnkey 1 RU system with a 10 Gigabit Ethernet connectivity along with a one Gigabit port to allow up to three HD video signals to be transferred between standards. It will also let you capture each stream with native-resolution recording to network attached storage. Two of the other members of the NewTek Connect line are also turnkey hardware designs: the NC1 Studio I/O Module, which is an 8 channel device for interfacing NDI with SDI, and the NC1 Studio Input Module boasting four video input channels and support for 3G-SDI. There is also NewTek Connect Pro, which is a software-only offering with four configurable video channels and multi–purpose I/O with NDI video translation. As the industry is learning, the switch to IP involves much more than just a new wiring infrastructure. But the rewards are worth it.